Corporal John Morris – 77th OVI, Co.B. 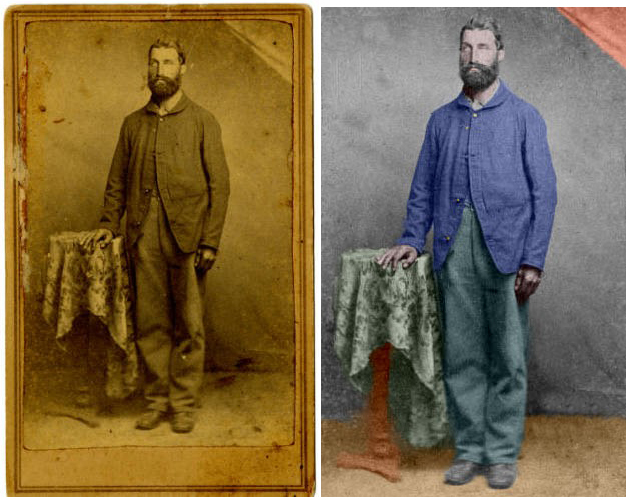 The picture on right was colorized by Camp No. 14 Brother Thom Duvernay. John Morris was born in 1832 in Watertown, Washington County, Ohio to John Morris, Sr. and Delilah (Biggins) Morris. His siblings included: William, Nancy, Tamar, twins Elza and Elwood, Harvey, and Minerva. The family was raised in Watertown. He married Rebecca Milner in 1855. He passed away in 1901. Near the start of the Civil War, John, along with twin brothers Elza and Elwood, joined the Union efforts by volunteering for the 77th Ohio Volunteer Infantry. His older brother William, younger brother Harvey, and brother-in-law Henry Smith (Tamar’s husband) volunteered as 100 day men in the 148th Ohio Volunteer Infantry. Cpl. Morris’ Company was at the vanguard of the Battle of Shiloh, where he fought along with two of his brothers (Elza and Elwood – twins). 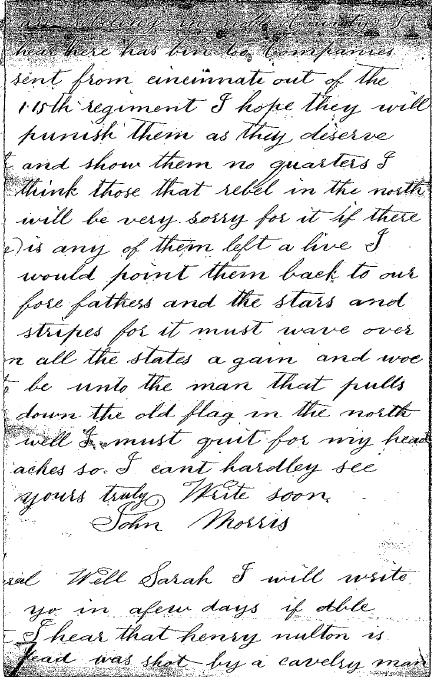 Cpl Morris also saw significant action in the Battle of Marks Mills where the Union supply train was overwhelmed by a superior number of Confederates waiting in ambush. After exhausting their ammunition supplies most of the remaining Union soldiers of the various regiments were taken as POWs and marched to Camp Ford, Tyler, Texas. While a Prisoner of War, John contracted scurvy and catarrah. The prisoners were poorly fed and clothed with little to no protection from the weather. Corporal Morris was later exchanged and rejoined the war effort in the capture of Mobile, Alabama. Morris’ continued service took him to Brownsville, Texas until 1866 in which he was mustered out. Corporal Morris suffered greatly during the war. He lost his twin brothers during the war, having to bring brother Elza’s body home to their family, and seeing his brother Elwood pass away shortly after. He also lost family at home due to diphtheria. He was a prisoner of war, and suffered poor health. He missed his wife and children tremendously while he served. Yet, John continued the fight bravely for such reasons as he stated in a letter to his parents – that we should remember what our forefathers fought for founding this nation, and that the stars and stripes should fly over every state. Organized in the fall of 1861, under Colonel Jesse Hildebrand, it reported to General Sherman at Paducah in February 1862. In April it participated both days in the battle of Shiloh, with heavy loss; and took part in the siege of Corinth until the evacuation when it moved westward, operating in Northern Mississippi and arriving at Memphis in July. It was ordered to Alton, Illinois in August, where it remained until July 1863, then moved to Helena, Arkansas. 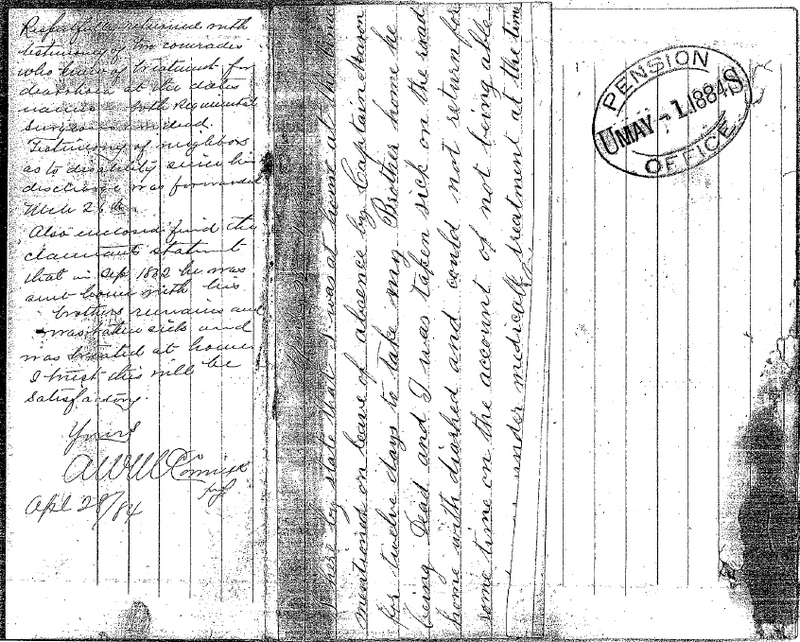 In January, 1864, the Regiment re-enlisted and went to Ohio on veteran furlough. In March it joined the Red River expedition and met with disaster. It took part in the capture of Mobile and then went to the Rio Grande where it served until mustered out March 8, 1866, the veterans having performed over four years of service. 77th Regiment Infantry. Organized at Marietta, Ohio, September 28, 1861, to January 5, 1862. Left State for Paducah, Ky., February 17, 1862. Attached to District of Paducah, Ky., to March, 1862. 3rd Brigade, 5th Division, Army of the Tennessee, to May, 1862. 2nd Brigade, 5th Division, Army Tennessee, to July, 1862. 2nd Brigade, 5th Division, District of Memphis, Tenn., to August, 1862. Alton, Ill., to August, 1863. 1st Brigade, 3rd Division, Arkansas Expedition, to January, 1864. 1st Brigade, 3rd Division, 7th Army Corps, Dept. of Arkansas, to April, 1864. 2nd Brigade, 3rd Division, 7th Army Corps, to May, 1864. 3rd Brigade, 1st Division, 7th Army Corps, to February, 1865. 3rd Brigade, 3rd Division, 13th Army Corps (New), Military Division West Mississippi, to June, 1865. Dept. of Texas, to March, 1866. SERVICE.--Moved from Paducah, Ky., to Savannah, Tenn., March 6-10, 1862. Expedition to Yellow Creek, Miss., and occupation of Pittsburg Landing, Tenn., March 14-17. Expedition to Eastport, Miss., and Chickasaw, Ala., April 1. Battle of Shiloh, Tenn., April 6-7. Corinth Road April 8. Advance on and siege of Corinth, Miss., April 29-May 30. March to Memphis, Tenn., via LaGrange, Grand Junction and Holly Springs June 1-July 21. Duty there till August 27. Ordered to Alton, Ill., and duty there as guard of Military Prisons till July 31, 1863. Moved to Helena, Ark., July 31, thence to Duvall's Bluff August 22. Steele's Expedition to Little Rock, Ark., September 1-10. Bayou Fourche and capture of Little Rock September 10. Duty at Little Rock till September 23. Regiment reenlisted December 20, 1863, and mustered in as Veterans January 22, 1864, and moved to Columbus, Ohio. Returned to Little Rock March 1-17. Steele's Expedition to Camden March 23-May 3. Okalona April 2-3. Prairie D'Ann April 9-12. Camden April 15-18. Mark's Mills April 25, most of Regiment captured. Evacuation of Camden April 27. Jenkins' Ferry April 30. Duty in the Dept. of Arkansas till February, 1865. Regiment exchanged February, 1865, and ordered to New Orleans, La., February 9. Moved to Mobile Point, Ala., February 20. Campaign against Mobile and its defences March 17-April 12. Siege of Spanish Fort and Fort Blakely March 26-April 9. Occupation of Mobile April 12. Advance to Mt. Vernon April 13-22. Moved to Mobile May 12, thence to Texas June 1-9. Duty at Brazos Santiago and Brownsville and in the Dept. of Texas, till March, 1866. Mustered out March 8, 1866. Regiment lost during service 2 Officers and 68 Enlisted men killed and mortally wounded and 2 Officers and 208 Enlisted men by disease. Total 280. I once more take my pen in hand to write you a few lines and let you know how I am getting along. I have been sick about two weeks and am very unwell yet I can walk round and that is about all. I have the diarrhea fever and a very bad cough and pain in the head. I received your letter and am very glad to hear you are well and I am very glad to hear from my family. I have not had a letter from Becca since the twenty-eighth of last month. I have been looking for a letter from her for a week yet none comes. 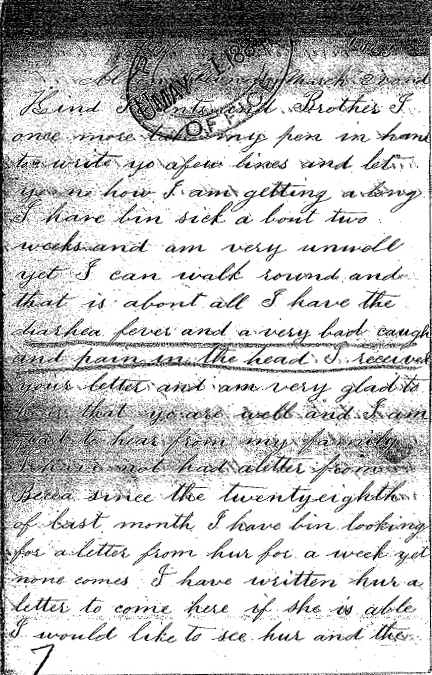 I have written her a letter to come here if she is able. I would like to see her and the (? Possibly missing a word(s) ?) once more and the rest of you, but it is very likely I never shall. God only knows. Father I want you to see her as soon as you can and if she wants to come help her of tell her not to start with less than fifty dollars if she comes. I want her to stay while we stay here or ‘til I am better or gone. She can pack some things in a trunk. She can do as you all think best about bringing the children. I would be very much to see them. There is five months’ pay coming to us, but I don’t know when we will get any of it. We have had some fine weather here, but it is raining today. I hope these few lines may find you all enjoying good health. Give my love to all my friends that are Union and alike. Share yourselves, write soon, and give me the news. I hear that they are rebelling in Noble County. I hear there has been two companies sent from Cincinnati out of the 115th Regiment. I hope they will punish them as they deserve and show them no quarters. I think those that rebel against the North will be very sorry for it if there is any of them left alive. I would point them back to our forefathers and the Stars and Stripes for it must wave over all the states again and woe be unto the man that pulls down the old flag in the North. Well I must quit for my head aches so I can’t hardly see. Well Sarah I will write you in a few days if able. I hear that Henry Nulton is dead. Was shot by a cavalry man.